An animal protection campaign has been launched at a large pagoda in Ho Chi Minh City by WildAid, the African Wildlife Foundation, and Vietnamese non-governmental organization CHANGE to raise awareness of protecting elephants and other animals with ivory. 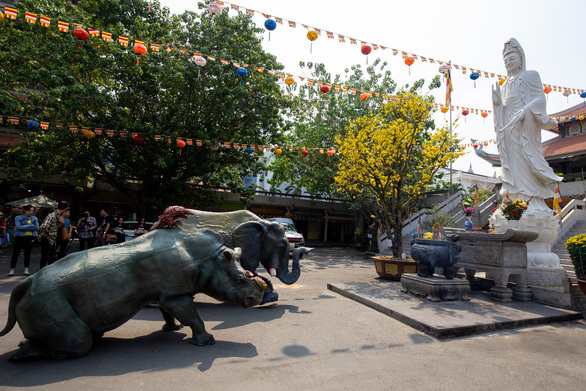 The “Cause no torment, that’s salvation” campaign kicked off on Monday with the sudden appearance of the realistic statues of the rhino, pangolin and elephant installed in the kneeling position at Vinh Nghiem Pagoda in District 3. 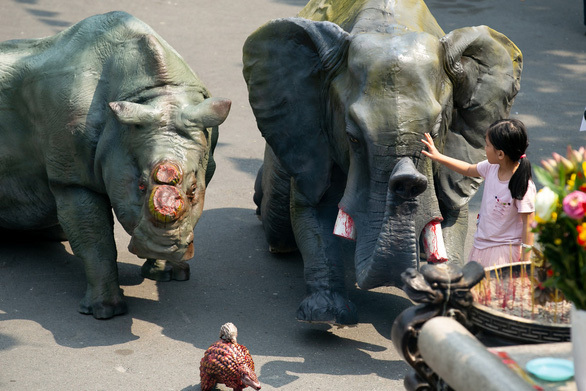 The three lifelike statues -- a dehorned rhino, a pangolin stripped of its scales, and an elephant with its tusks cut off, all of which are bleeding -- are used as the main images of the campaign. Elephants, pangolins and rhinoceros are currently listed as endangered species in Vietnam and are protected by the government through the prohibition of sales of their body parts. The statues of the three animals, so meticulously made that they look just like real creatures, were placed in front of the giant statue of Guanyin, the Buddhist Goddess of Mercy, right in the center of the Vinh Nghiem Pagoda for one day before being moved to Minh Dang Quang Pagoda in District 2. In a short discussion with Tuoi Tre (Youth) newspaper, CHANGE communication manager Nguyen Tran Tung explained why the campaign organizers came up with this idea of placing statues of wild animals in suffering at religious institutions. “We know that some of those who consume elephant tusks, pangolin scales and rhino horns still go to the pagoda,” Tung said. The CHANGE media person said that by putting the wild animal statues in the kneeling position in front of the Guanyin statue, the campaign organizers want to convey a message that these poor creatures that are hurt by humans are wishing for protection from the Buddhist Goddess of Mercy. “We hope people will think twice before doing anything that harms wildlife, directly or indirectly,” Tung elaborated. After staying at Minh Quang Dang Pagoda from January 30 to February 11, the animal statues will be on display at Khanh An Monastery in District 12 from February 12 to 18, and Tay Thien Pagoda in the northern province of Vinh Phuc between February 22 and 24. The statues will return to Vinh Nghiem Pagoda on March 4 and stay there until the campaign wraps up on March 10. “We and the abbot of Vinh Nghiem also discussed a plan to have the statues stay permanently at the pagoda, so they can function as decorations while continuing to raise people’s awareness of wildlife protection,” Tung said. Before “Cause no torment, that’s salvation," WildAid and CHANGE also ran other campaigns to promote wildlife protection, with the participation of several influencers and public figures in Vietnam. WildAid is a U.S.-headquartered organization that works to reduce the demand for endangered species products, while CHANGE is a non-governmental organization whose mission is to bring about sustainable change to environmental and developmental sectors through creative communication.